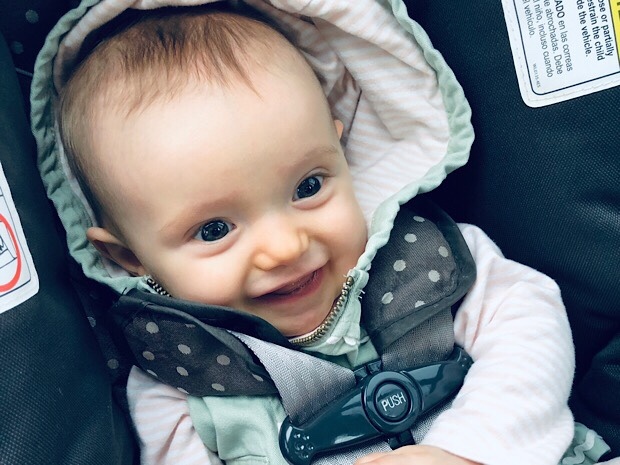 Sadie is a little over five months now and this is the first official update I’ve written for her! This was so much fun that I’m already looking forward to writing her next monthly update and seeing how she has changed and grown. Growth She was 13lbs 10oz at her last visit to the pediatrician on 2/15, so I’d guess she’s around 14lbs now. 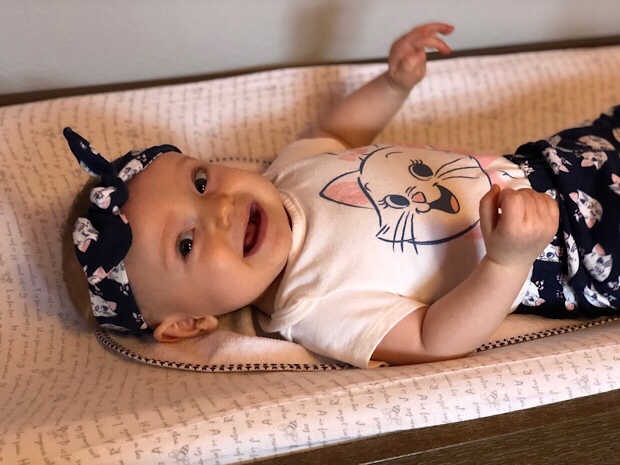 She was 24 inches at her four month check up, so she’s somewhere around there with her height! Wearing It all depends on the brand and type of clothing! She’s in some three month onesies, 3-6 month outfits, 6 month sleepers, and size 2 diapers. Eating She’s still exclusively breastfeeding, but she’s very interested in food! She sits with us at the dinner table and is constantly reaching for our food and drinks. She has reached the age where she’s very distractible while eating. I usually have to make sure our environment is quiet and shoo the pets out of the room because they distract her and we end up with milk everywhere, lol. She also still refuses to take a bottle. I guess the plus side of that is less cleaning and sanitizing?! 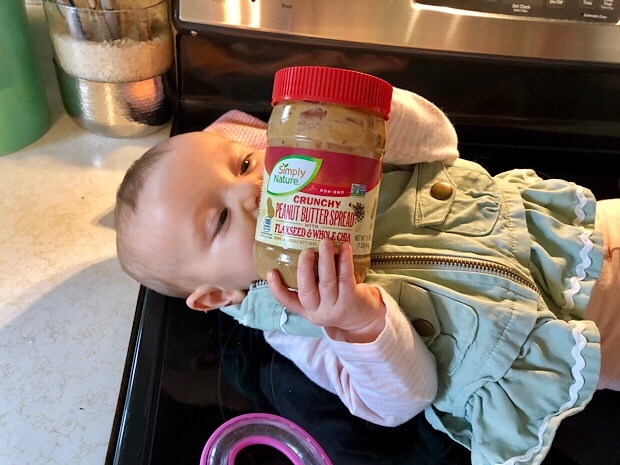 Sadie is excited to start eating peanut butter soon! Personality Sadie is very pleasant! She freely smiles at strangers and makes the cutest squealing sounds when she’s happy. She’s the happiest first thing in the morning and wakes up very smiley. Nicknames Sader Tot, Tot, Totling, Tottle Berry, and Todd. Tot turned into Todd because I said it weird one time and now we occasionally call our poor daughter Todd (sorry Sadie!). We call her Tot the most, though. Sleeping Sadie generally takes three naps a day; one in the morning, one in the afternoon, and a quick snooze in the evening. She goes to bed around eight and is up to eat about three times in the night… I don’t usually keep track of how many times she’s up because I’m so groggy at that point, haha. We try to start her off sleeping in her crib and then she ends up in bed with us. 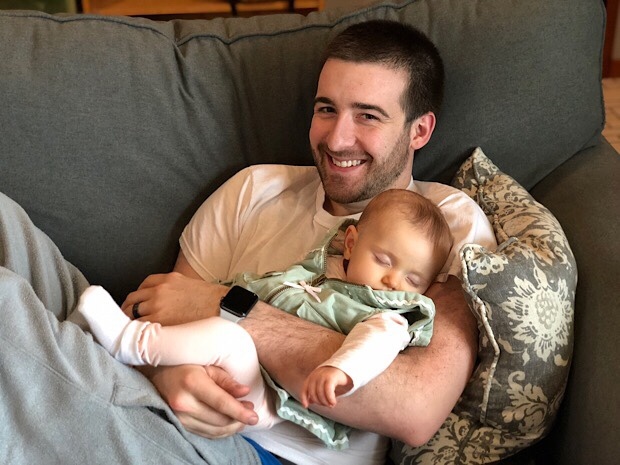 I could write a whole post on this because before we had Sadie, Jimmy and I were not co-sleeping with our baby, and here we are… co-sleeping with our baby haha. Fellow parents, do you have any tips? Looks like Her dad! Her hair is light brown (it was pretty dark at birth), her eyes are gray-ish blue or hazel/brown depending on the lighting or what she’s wearing, and her complexion is darker than mine and Jimmy’s, lol. New skills She can roll from her front to back, grab her toes and put them in her mouth, and is a pro at putting pretty much anything in her mouth. Likes Mavis (I should say love; she is infatuated with Mavis), Lola, Malcolm, toys that light up and make noise, her jumper, screens (her absolute favorite thing to watch is this Baby Macdonald video by Baby Einstein on Youtube), mom and dad, other kids, bath time, being lifted in the air, puppets, reading books with flaps, music, standing (with someone holding her), and grabbing her toes and sucking on them. Dislikes Not being held, being put in her carseat, pacifiers, bottles, sleeping in her crib, overstimulation, and feeling tired or hungry. Favorite Products Lift-a-flap books, Bright Starts activity gym, Comotomo teether, Baby Merlin’s Magic Sleepsuit, Stacking Rings, LeapFrog My Pal Violet, Taggy blanket, Bee Crawl Toy, Hedgehog Rattle, Zoo Hand Puppets, Bug-A-Loop Teether, stuffed puppy, Mama Bear diapers, and activity jumper. Other Notes It seems like Sadie is teething–she chews everything and we think we can see white at the bottom front of her gums. Time will tell! 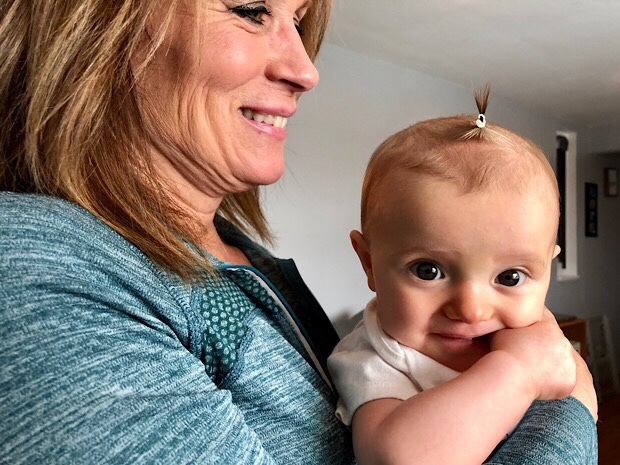 Her hair has grown enough that I can put it in a mini ponytail or clip and it’s adorable. She went through a phase where she hated tummy time, but now she tolerates it if she has entertainment. She has been to the library and shopping a lot lately… #winteractivities. We’re looking forward to warm weather in the coming months so we can get outside and visit the zoo and parks! Poor Sadie girl came down with an ear infection last week. She randomly started tugging on her ear and acting not at all like her happy-go-lucky self. I gave her some Tylenol and booked an appointment to see the pediatrician the next morning. Sadie did well at the appointment, except when the pediatrician wanted to look in her ear. We left the office with a diagnosis of an ear infection, a script for an antibiotic, and were on our way. I’m so thankful we were able to get in to the doctor quickly. Our little chicka doesn’t seem to be in too much pain. She’ll tug her ear and cry every now and then, and she’s not sleeping great, but she has taken everything in stride (even the diaper rash from the medicine, ugh). Getting the antibiotic in her has been quite the challenge! We tried giving her the amoxicillin in a mini medicine bottle, but that was a bit of a disaster, haha. As I’ve mentioned before, she’s not a fan of bottles. We thought maybe she’d take the medicine from a bottle because it was bubblegum flavored, but nope! We’re using a syringe, but it seems like she just pushes the medicine right out of her mouth. Fellow parents, do you have any tips?! Okay, enough about ear infections and bottles! Did everyone have a nice weekend? 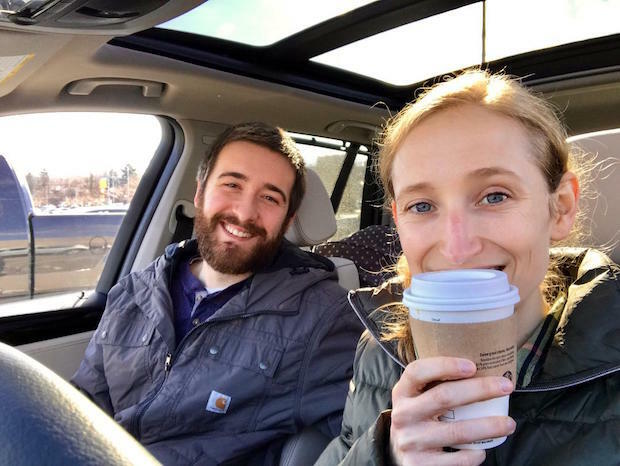 It was cold here in Pittsburgh, but we stayed warm with coffee! My mother-in-law gave us Starbucks gift cards for Christmas, so we’ve been enjoying great coffee lately! I tried the Papua New Guinea blonde roast and loved it. 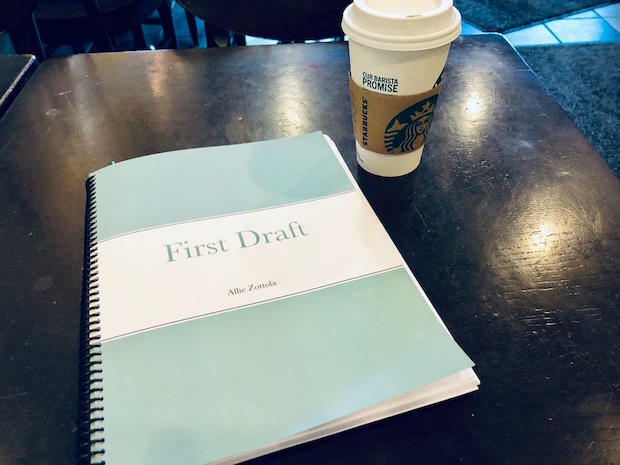 I had coffee on the brain this morning (see above about not getting much sleep, lol), so Sadie and I went on a little Starbucks date so I could work on editing my book. I tried the Kenya Barichu Reserve coffee, which was awesome. Having the Reserve coffee brewed in Starbuck’s Clover Brewing System was such a treat and reminded me of my coffee date with my dad around this time last year! Is anyone else really into the flavor profile of coffee, or are you in the coffee is coffee camp? At home, Jimmy and I brew the Fair Trade Organic whole bean coffee from Aldi because it’s less than $5 for a 12 ounce bag and the coffee tastes great. If we go out to coffee shops like Starbucks, though, I really enjoy trying different blends and drinks! Well, I better wrap this post up. Sadie is currently napping on me (I’m practicing my typing-with-one-hand skills, lol) and is starting to stir. Before I go, I need your help! I’m still deciding on what to cook for our Valentine’s Day get-together. I’m considering the following: chili and cornbread, grilled barbecue ribs and chicken, spaghetti and meatballs, or a make your own pizza bar. What would you pick? !